Distraction osteogenesis (DO), a well-established technique used for several decades by orthopedic surgeons to repair long bone defects, has, over the past 15 years, gained acceptance for correction of various craniofacial deformities. Bone distraction is not a new concept. Distraction was introduced first by Codvilla nearly a hundred years ago and was subsequently popularized during the 1940s by Ilizarov, who developed a single-stage procedure to lengthen long bones without the use of grafting material. The feasibility of applying Ilizarov's principles to different craniofacial deformities was not considered until several decades after his pioneering work in the peripheral skeleton. The underlying principle of DO, as described by Ilizarov, is "the mechanical induction of new bone between bony surfaces that are gradually distracted." The process of DO begins with careful preoperative assessment and planning, which are critical to success. At the initial surgery, osteotomies are performed and the distraction device is inserted. A waiting period (latency phase) is allowed to elapse during which bone healing is initiated at the bony gap. In this early period, periosteal integrity is restored and callus formation begins. The bone segments at either end of the gap are then progressively distracted over a period of several days (distraction phase) during which osteogenesis is induced, thus producing a so-called regenerate of immature bone laid down between the cut bone ends. Over time, the bone remodels into a more mature state (consolidation phase), and the surrounding soft tissues adapt to their new positions and lengths. The histology and physiologic principles underlying DO have been well documented in long bones and, more recently, in the craniofacial skeleton. During the distraction phase, bone formation occurs in response to tension-stress forces exerted on the regenerate, and healing proceeds primarily by a regenerative membranous ossification process. The middle of the regenerate consists of a fibrous central zone where osteoid is deposited with collagen fibers oriented parallel to the direction of distraction. Ossification occurs as a primary mineralization front advances from either end of the fibrous central zone, resulting in a bridge of immature bone across the distraction gap. Bone remodeling begins during the consolidation phase and continues over 1-2 years, eventually transforming the regenerate into a mature osseous structure similar in size and shape to the adjacent bone. Although the volume of new bone is comparable to that of adjacent bones, animal studies show that mineral content and radiodensity is approximately 30% less, as is the tensile strength of the regenerated segment. A number of factors are known to influence the physiologic process of DO, and these can be separated into 2 basic groups: bone factors and distraction factors. Osteocyte viability is essential to provide an adequate source of osteoblastic activity at the distraction site; hence, exercise careful surgical technique to minimize thermal or mechanical bone injury. Similarly, an adequate blood supply to the distraction site is critical to osteogenesis. Arterial insufficiency may lead to ischemic fibrogenesis within the regenerate, yielding a loose irregular collagen network instead of the desirable dense regular collagen pattern. Venous outflow obstruction has been associated with cystic degeneration of the regenerate. The clinician, therefore, must ensure that soft tissues surrounding the site of proposed distraction are well vascularized. Early studies in long bones concluded that both an intact periosteum and endosteum were critical to successful osteogenesis; therefore, many advocated that a corticotomy be performed only through a minimal periosteal opening. More recently, however, investigators have demonstrated that the periosteum alone can provide sufficient osteogenic capacity for a healthy regenerate, and this is especially true in the well-vascularized membranous bone of the craniofacial skeleton. Therefore, while some clinicians advocate a corticotomy, most reports of craniofacial DO describe the use of a complete osteotomy (taking care to preserve as much of the surrounding periosteum as possible). Prior radiation therapy to the distraction site does not adversely influence the results of distraction (in the canine model), and when using DO to repair segmental defects, the status of the surrounding soft tissues probably is the key factor influencing outcome. The latency, rate, and rhythm of distraction are all known to influence the quality of the regenerate. Of these factors, the effect of latency is the most controversial. Most craniofacial surgeons have empirically applied the conclusions from long bone studies and recommend waiting 4-7 days following osteotomy before initiating the distraction process. In younger children, the high rate of bone metabolism would favor a shorter waiting period. [7, 8] Some clinicians, however, use a zero latency period and begin distracting upon appliance insertion, claiming no adverse effects on outcome, while substantially shortening the treatment period. Waiting too long prior to distraction (ie, >10-14 d) substantially increases the risk of premature bone union. In contrast to latency, the rate and frequency (ie, rhythm) of distraction are considered important variables. If widening of the osteotomy site occurs too rapidly (ie, > 2 mm/d), then a fibrous nonunion results, whereas if the rate is too slow (ie, < 0.5 mm/d), then premature bony union prevents lengthening to the desired length. These findings in long bones have been empirically applied to the craniofacial skeleton, and most studies have described a rate of 1.0 mm/d. According to Ilizarov's work in long bones, the ideal rhythm is a continuous form of distraction; however, this is impractical on a clinical basis. Therefore, most reports have used distraction frequencies of 1-2 times daily. The length of the consolidation phase has been recommended to range from 6-12 weeks in long bones, depending on the length of the distraction segment. In the craniofacial skeleton, most authors advocate a range of 4-8 weeks. The general rule holds that the consolidation period should be at least twice the duration of the distraction phase. Finally, appliance rigidity during distraction and consolidation is a critical element to ensure that bending or shearing forces do not result in microfractures of the immature columns of new bone within the regenerate, which lead to focal hemorrhage and cartilage interposition. Several factors can limit or preclude the use of distraction osteogenesis (DO) to correct craniofacial deformities. Few absolute contraindications to the use of this technique exist; however, caution is advised in patients who, for one reason or another, will not comply with the distraction regime. From a surgical standpoint, an adequate bone stock is necessary to accept the distraction appliances and to provide suitable opposing surfaces capable of generating a healing callus. Therefore, in patients who have undergone several craniofacial procedures in the past, the facial skeleton may exist in several small discontinuous fragments unsuitable for distraction. In these cases, bone grafting the gaps first may be possible, followed by distraction on a delayed basis. Age should also influence the surgeon's decision. Although distraction has enabled procedures to be performed in patients of a much younger age than with conventional craniofacial surgery, exercise caution in the very young because working with the small fragile bones in these patients becomes increasingly difficult. Also, remember that many relatively straightforward cases exist, in which equivalent results can be obtained with conventional techniques. In such scenarios, prudence calls for use of the time-tested procedures. Such caution is especially true in orthognathic repositioning for most dentofacial deformities. Ilizarov GA. The principles of the Ilizarov method. Bull Hosp Jt Dis Orthop Inst. 1988 Spring. 48(1):1-11. [Medline]. Costantino PD, Friedman CD, Shindo ML, et al. Experimental mandibular regrowth by distraction osteogenesis. Long-term results. Arch Otolaryngol Head Neck Surg. 1993 May. 119(5):511-6. [Medline]. Taylor JA, Derderian CA, Bartlett SP, Fiadjoe JE, Sussman EM, Stricker PA. Perioperative Morbidity in Posterior Cranial Vault Expansion: Distraction Osteogenesis versus Conventional Osteotomy. Plast Reconstr Surg. 2012 Apr. 129(4):674e-80e. [Medline]. McCarthy JG, Schreiber J, Karp N, et al. Lengthening the human mandible by gradual distraction. Plast Reconstr Surg. 1992 Jan. 89(1):1-8; discussion 9-10. [Medline]. Donneys A, Tchanque-Fossuo CN, Farberg AS, Deshpande SS, Buchman SR. Bone regeneration in distraction osteogenesis demonstrates significantly increased vascularity in comparison to fracture repair in the mandible. J Craniofac Surg. 2012 Jan. 23(1):328-32. [Medline]. Tibesar RJ, Sidman JD. Mandibular distraction osteogenesis in the pediatric patient. Curr Opin Otolaryngol Head Neck Surg. 2008 Dec. 16(6):548-54. [Medline]. Higuera S, Cole P, Stephenson JB, Hollier L. Distraction rate and latency: factors in the outcome of paediatric maxillary distraction. J Plast Reconstr Aesthet Surg. 2008 Nov 5. [Medline]. Tahiri Y, Taylor J. An Update on Midface Advancement Using Le Fort II and III Distraction Osteogenesis. Semin Plast Surg. 2014 Nov. 28 (4):184-92. [Medline]. [Full Text]. Dauria D, Marsh JL. 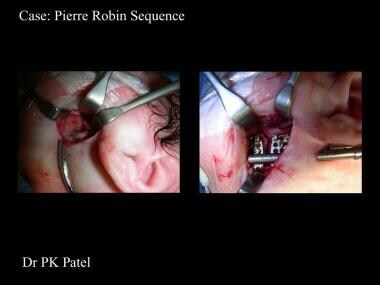 Mandibular distraction osteogenesis for Pierre Robin sequence: what percentage of neonates need it?. J Craniofac Surg. 2008 Sep. 19(5):1237-43. [Medline]. Chen PK, Por YC, Liou EJ, Chang FC. The effect of cleft maxillary distraction osteogenesis on the levator veli palatini and velopharyngeal function. J Craniofac Surg. 2015 May. 26 (3):687-90. [Medline]. Al-Daghreer S, Flores-Mir C, El-Bialy T. Long-term stability after craniofacial distraction osteogenesis. J Oral Maxillofac Surg. 2008 Sep. 66(9):1812-9. [Medline]. Reddy LV, Elhadi HM. Maxillary advancement by distraction osteogenesis. Atlas Oral Maxillofac Surg Clin North Am. 2008 Sep. 16(2):237-47. [Medline]. Cohen SR, Rutrick RE, Burstein FD. 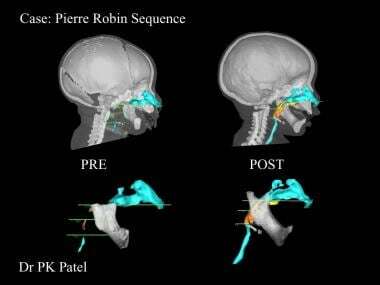 Distraction osteogenesis of the human craniofacial skeleton: initial experience with new distraction system. J Craniofac Surg. 1995 Sep. 6(5):368-74. [Medline]. Imola MJ. Craniofacial distraction osteogenesis. Current Opin Otolaryngol Head Neck Surg. 2001. 9:238-248. Imola MJ, Hamlar DD, Thatcher G, et al. The versatility of distraction osteogenesis in craniofacial surgery. Arch Facial Plast Surg. 2002 Jan-Mar. 4(1):8-19. [Medline]. Molina F, Ortiz Monasterio F. Mandibular elongation and remodeling by distraction: a farewell to majorosteotomies. Plast Reconstr Surg. 1995 Sep. 96(4):825-40; discussion 841-2. [Medline]. Toth BA, Kim JW, Chin M, Cedars M. Distraction osteogenesis and its application to the midface and bony orbit in craniosynostosis syndromes. J Craniofac Surg. 1998 Mar. 9(2):100-13; discussion 119-22. [Medline].